LCD – Detail, Accuracy, Brightness. The PIX-E5 monitors excel in all those aspects with their IPS, 500 nit, 1920×1080, 441 ppi LCD displays. It has never been faster to zoom in and check focus! TapZoom provides instant 2x or 4x zoom to where you tap on the touch screen. Tap again to zoom out. The 4K-compatible PIX-E5 offers the full range of Apple ProRes codecs including the highest quality Apple ProRes 4444 XQ. This is a 12-bit codec designed to preserve the detail in wide dynamic range imagery captured by today’s high performance digital image sensors. PIX-E5 can record 4K up to 30 fps, UHD up to 30 fps and 1080p or 720p up to 120 fps. The PIX-E5 records to the innovative, super fast SpeedDrive, a custom-designed enclosure for an industry standard mSATA drive. The SpeedDrive, which plugs directly into the PIX-E, doubles as a USB 3.0 thumb drive for very high speed offload to any computer without the need for a special cable or drive docking station. Two SpeedDrive options are available, a 240 GB SpeedDrive and anEnclosure-Only version that allows the user to choose and easily fit any size of mSATA drive. mSATA drives are available in sizes ranging from 128 GB to 1 TB. Some functions are better controlled via touch screen and others by real buttons. 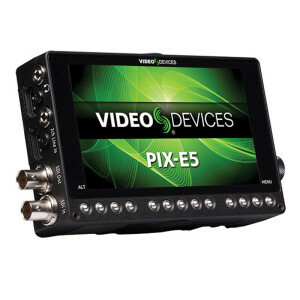 PIX-E5 incorporates both types of control. The touchscreen is best used when interacting directly with a specific area of the displayed image such as zooming in to a point of interest with TapZoom. Buttons allow the operator to locate a control without looking and instant tactile response leaves no doubt a function has been activated. Button control is well suited to commands such as ‘Record’ where failure to activate can be catastrophic. With a compact, die-cast metal chassis, nutted connectors, and an LCD protected by scratch-resistant and optically-bonded Gorilla Glass 2, the PIX-E5 field recording monitors are designed to withstand the most extreme and demanding production environments. The PIX-E5 is powered by external DC (10-34V) or dual L-mount Sony batteries with powering seamlessly switching from one source to another should one become depleted or removed. The following documents act as quick-reference resources for how to best set up your camera when integrating with the PIX-E5.